As part of Capture Photography Festival 2013, Equinox Gallery is very pleased to present three separate exhibitions of photographic works by Fred Herzog, David Hockney, and Geoffrey James. All three exhibitions will run November 2–23, 2013, at Equinox Gallery. 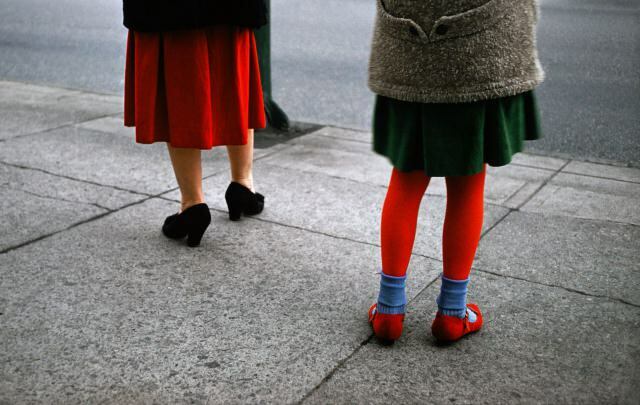 This exhibition includes a series of previously unseen photographs by Fred Herzog (b. 1930). For over fifty years, Herzog worked almost exclusively with Kodachrome slide film but only in the last few years has technology allowed him to make archival pigment prints that match the exceptional colour and intensity of the Kodachrome slide. Herzog’s use of colour was unusual in the 1950s and ’60s, a time when art photography was almost exclusively associated with black-and-white imagery. In this respect, his photographs can be seen as a pre-figuration of the “New Colour” of photographers such as Stephen Shore and William Eggleston, which received widespread acclaim in the 1970s. This exhibition includes the complete portfolio of twenty chromogenic prints produced by David Hockney (b. 1937) from 1970 to 1975. For Hockney, the camera functions as sketchbook and diary, recording his travels across the globe, the intricate network of dwellings, objects, friends, and images that define his life. Born in Wales, Geoffrey James studied modern history at Wellington College and Oxford University before immigrating to Canada. Since the 1970s James has been active as a photographer, exploring consciously planned landscapes from the past and the more unintentional landscapes of the present. His unflinching and masterful photographs investigate the social role of architecture and space, and the ways in which we interact with these elements. A retrospective of his work was mounted at the National Gallery of Canada in 2008, and he won the Governor General’s Award in Visual and Media Arts in 2012.